While this pile of fried goodness isn’t octopus tentacles or pork loins, it is a pile of what “Yankee Magazine” has dubbed the “Best Fried Clams” for 2011. 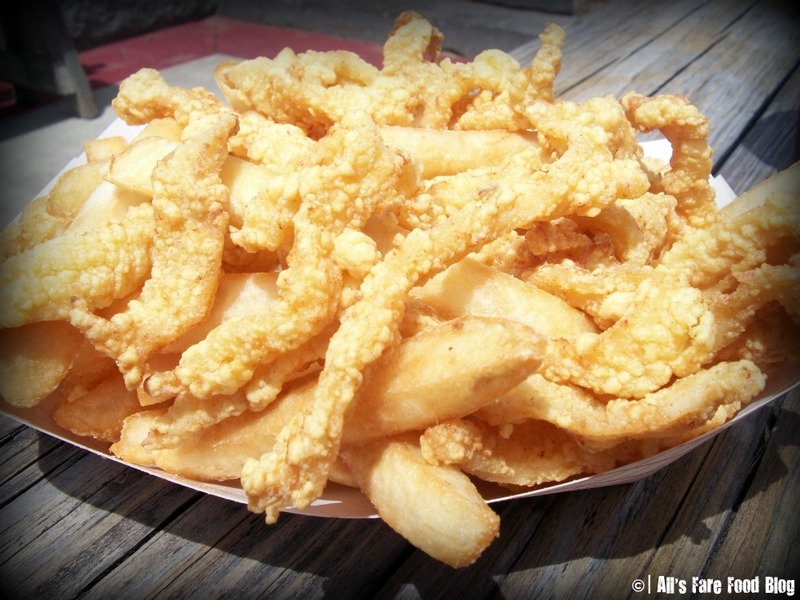 At the unassuming Mel’s Funway Park in Litchfield, NH, you will find Woodman’s of Litchfield, an offshoot of Woodman’s of Essex (Massachusetts), a New England staple that has laid claim to inventing fried clams in 1916. After hitting a bucket of golf balls on the driving range or shooting a round of laser tag, head over to the wooden shack next to the mini-golf course at Mel’s Funway and enjoy one of Woodman’s famous fried plates of clams, shrimp or haddock. Or, you could enjoy jumbo clamcakes, lobster rolls or clam chowder. There is a small dining area inside or you can venture outside to a tented area with wooden tables and benches overlooking the small driving range. The wait for your meal can be long. I waited more than 20 minutes for my small fried platter that was a heaping mound of juicy fried clams. It comes with your choice of fries or onion rings. The fries were very ordinary, lacking personality, and seeming to have come from a freezer bag. The best part were the free refills of your drinks. It was great being able to keep my cup, go hit some softballs in the batting cage and come back in to the cool air to rehydrate. With little food and snack choices at Mel’s Funway, Woodman’s of Litchfield provides the necessary fuel for a fun day in the sun that includes go-karting and other activities. Mel’s Funway Park and Woodman’s of Litchfield are about 53 miles north of Boston, a little over an hour jaunt. Foodie Trivia: The original Woodman’s of Essex was featured in the 2010 Adam Sandler film “Grown Ups,” also starring Kevin James, Chris Rock, David Spade, Rob Schneider, Salma Hayek and Maria Bello. This entry was posted in Cuisine - American, Cuisine - Seafood, Places - Massachusetts, Places - New England and tagged Adam Sandler, awards, Boston, Chris Rock, clam chowder, David Spade, fried clams, Grown Ups, haddock, Hollywood, Kevin James, lobster rolls, Maria Bello, Mel's Funway, mini-golf, movie, Nashua, New Hampshire, Rob Schneider, Salma Hayek, shrimp, Woodman's of Essex, Woodman's of Litchfield, Yankee Magazine by Christina. Bookmark the permalink.